One of Canadian PM Justin Trudeau's top ministers has quit saying she has lost confidence in the government's handling of a corruption inquiry. Treasury Board President Jane Philpott said: "I must abide by my core values, my ethical responsibilities, constitutional obligations." Mr Trudeau said he was disappointed by the resignation, but understood it. He has denied political meddling to shield engineering firm SNC-Lavalin from a bribery trial. Opposition Conservatives last week called on the Liberal PM to resign. A number of opinion polls indicate Mr Trudeau's popularity is slipping in the run-up to a general election scheduled for October. What did Jane Philpott say? The cabinet minister announced her decision to step down on Monday, posting her resignation letter detailing her "serious concerns" with "evidence of efforts by politicians and/or officials to pressure the former Attorney General to intervene in the criminal case involving SNC-Lavalin". "There can be a cost to acting on one's principles, but there is a bigger cost to abandoning them," she said in a statement. Her letter said it had become "untenable" for her to continue to serve in the cabinet. "It is a fundamental doctrine of the rule of law that our Attorney General should not be subjected to political pressure or interference regarding the exercise of her prosecutorial discretion in criminal cases," she wrote. "Sadly, I have lost confidence in how the government has dealt with this matter and in how it has responded to the issues raised." The former family physician has held key portfolios in Mr Trudeau's cabinet - health, indigenous services and, until this week, treasury board president - since being elected in 2015. She will remain on as a Liberal member of Parliament. What about Mr Trudeau's response? In a short statement, Mr Trudeau thanked Ms Philpott for "her years of service and her dedication to Canadians". 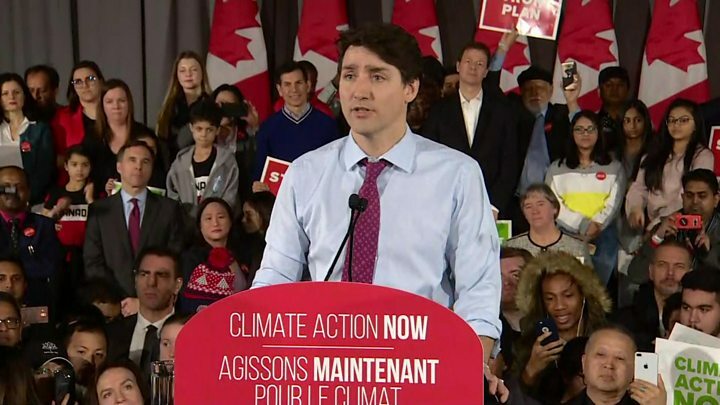 And commenting on the growing political scandal at a rally in Toronto later, the prime minister said: "Concerns of this nature must be taken seriously and I can ensure you that I am." What is the SNC-Lavalin affair? Quebec-based SNC-Lavalin is one of the world's largest engineering and construction companies. The firm and two of its subsidiaries face fraud and corruption charges in connection with about C$48m ($36m; £28m) in bribes it is alleged to have offered to Libyan officials between 2001-11. SNC-Lavalin says it would be unfair to penalise the company as a whole and its thousands of employees for the wrongdoing of former executives. The matter is proceeding to trial and the company says it will "vigorously defend itself" against the allegations. A conviction could result in a decade-long ban on bidding on Canadian federal contracts, which would be a major financial blow to the firm. 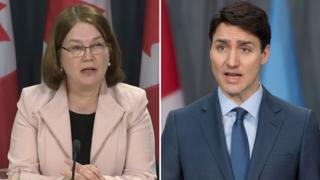 This is the third high-profile resignation following accusations Mr Trudeau and some of his top aides tried to shield SNC-Lavalin from a corruption trial. Former attorney general and justice minister Jody Wilson-Raybould resigned suddenly from Cabinet in February. On 18 February, Mr Trudeau's top aide, Gerald Butts, announced he would quit, denying in a statement that he or anyone on his staff had done anything wrong but saying he had to leave so as not to be a distraction from the team's "vital work". He is expected to speak on Wednesday before the House of Commons Justice Committee, which is looking into the matter. What are the political interference claims? Ms Wilson-Raybould has said she and her staff faced four months of a "sustained" and "inappropriate effort" late last year to push for a possible deferred prosecution agreement for SNC-Lavalin. The Liberal government brought in the remediation agreement regime in 2018 as part of a massive budget bill following lobbying efforts by the company. Ms Wilson-Raybould says she resisted that pressure and believes she was shuffled out of the justice portfolio as a consequence. Mr Trudeau has maintained that any discussions he had with Ms Wilson-Raybould were lawful and appropriate and that his government was concerned that thousands of jobs were at stake if the company went to trial.